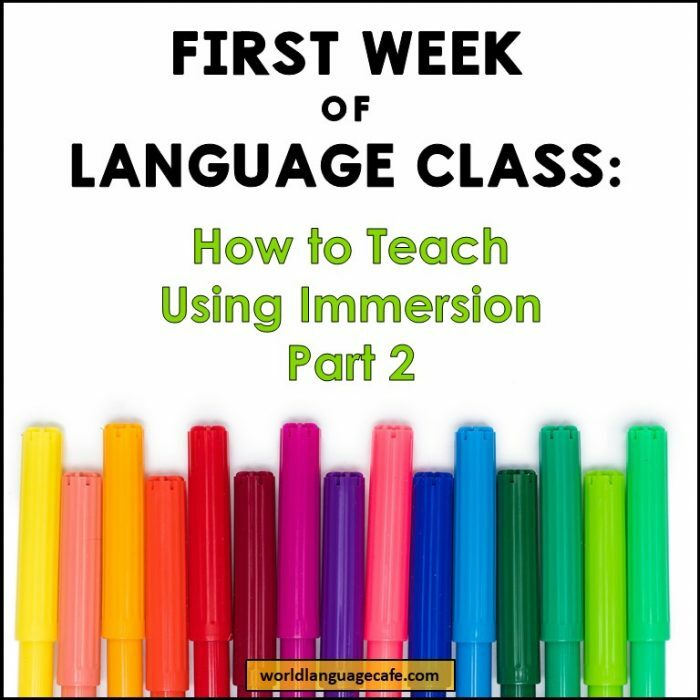 In my previous 4 posts, I’ve talked about why it’s so important to create an immersion atmosphere, how to set the tone for the year, and how to set expectations for the first day of Spanish class. (I’ll be using the word, “Spanish” throughout the post, but this information applies to any language). 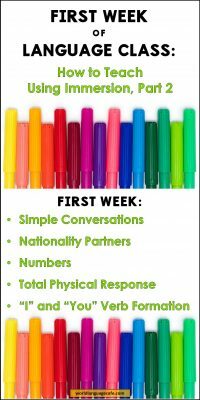 In this post about the first week of Spanish class, I’ll be sharing the lessons plans that I use, plus giving you some free resources to help you start your year off on the right track. My last post left off halfway through the first day of teaching. We had just finished going over brief introductions, rules, how to ask to go to the bathroom, and expectations for target language use. Today, we’ll continue on with the curriculum that I use for immersion. In Spanish 1, I prefer to create my own curriculum and use the textbook as little as possible, only for practicing activities that I have taught or for homework. I find that most Spanish 1-2 textbooks have too much English and aren’t based on how native speakers learn a language. Read more about that in “How Native Speakers Learn Differently than Language Learners“. Day 1: Hola, me llamo . . . ¿Cómo te llamas? Day 2: + Mucho gusto. Hasta luego. Day 3: ¿Cómo estás? Bien, muy bien, así así, mal. Day 4: ¿Cuántos años tienes? Tengo ____ años. Day 5: ¿Qué te gusta hacer? Me gusta ______. Day 6: ¿Quieres estudiar/trabajar/bailar conmigo? (start with estudiar and teach them how to say other common verbs or activities that they like). Sí, me gustaría. ¡Vámanos! Day 8: ¿Cuál es tu número de teléfono? Mi número es . . .? Now you may be thinking, “You’re teaching “tener and gustar” before teaching how to conjugate a regular verb? Yes, because this is how we naturally learn languages. Did you ever conjugate a verb when you were learning English? Nope! So don’t spend time doing this in class because all it does is train your students to think, “Hmm . . . how do I say that – let me go through the conjugation in my head”. Instead, teach your students only the “I” and “you” forms for common conversations that happen every day. The majority of our daily conversations use these two forms. Think about the conversations that you have on a daily basis – most of them use “I” and “you”, right? That’s what students need most to be able to communicate. Read more about this technique here. Have students fill out these free nationality partner sheets (a different partner for each nationality). You call out a nationality and they find someone in the room and say, “Hi, what’s your name?” and then write down the person’s name next to the nationality. Whenever students need partners, in the target language, I call out a nationality, (ex. Mexican partners), and the students pair up with that partner. This helps them learn the countries, the nationalities, and work with a variety of students throughout the year. Get these in French and Spanish in my Free Resource Library. For curriculum, whatever you begin with is up to you, but personally, I like to start with numbers since students will be using them to say how old they are very soon. The key is to teach them and then have your students be able to recognize and say a number instantly. Being able to count is great, but you don’t want your students counting to figure out how to say 13. In partners have them roll a die and say the number out loud. Add another die and have them say the two numbers and the sum. Ex. 6+5=11 Use a page of only numbers and have them read the numbers out loud as they would read a paragraph. (Number Reading Page available in my Free Resource Library – sign up below). (After I wrote this post, I added 2 additional blog posts on how to teach numbers). Maybe it’s because I was a fidgety student (and still can’t sit still), but I love adding movement to my classes. Give instructions and have your students do them while you say them, “Stand up. Sit down. Walk to the board. Write your name. Take out your (pencil, paper, notebook). Repeat “______”, Give me your paper, give your paper to Pablo., etc.”. Be careful not to introduce too many at a time. Pick 3 or 4 to work on and add a few more each day. Limit this to 10-15 minutes a day. Day 1: Class, stand up. Sit down. (Repeat several times). Walk. Run. Write your name. (Have the whole class do it, call on a few kids to do it, and call on individuals). Don’t ask for volunteers – just call on students randomly. That way they have to pay attention and they’ll know you’re no joke! Ask yes/no questions. Is Juan standing up? Is he running? Is he walking or running? Day 2: (Add more detail). Stand up. Walk to the board. Write your name on the board. Walk to the window. Take out your pencil and paper. Who is this? What’s his/her name? Is this Carla or Sophia? Day 3: I like to teach verbs early on because they are essential for communicating, so I throw in dance, sing, eat, drink. “Is Jack eating? What is he eating?” Answer the question with something funny – spaghetti – and model long strands of spaghetti and wrapping it around the spoon). Throw in crazy stuff. Is he eating pencils? (he pretends to be eating pencils). Is he eating spiders? (Draw a picture of a spider on the board). Pick your class comedian or a really active boy to act these out. The whole class will laugh and he’ll love being the center of attention. At the end of your TPR sessions each day, test to see if students understand the new words by having them close their eyes. You say an action to see if they can do it. This will show you who is getting it, who isn’t, and what you need to review more. Teach students 5-6 basic verbs (dance, eat, drink, sing, walk, run, write). After you have practiced the meanings with some TPR, ask simple questions and show how you cut off the AR, ER, IR, and add “o” to say what you’re doing. 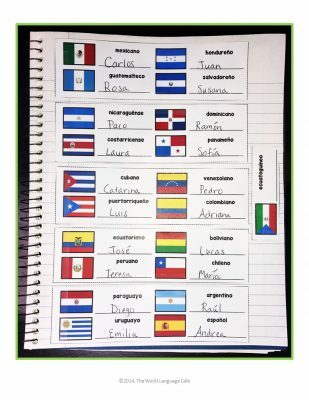 I use interactive notebook flashcards to have them practice this (French, Spanish). . . Are you dancing? Yes, I’m dancing. Are you eating? Yes, I’m eating. Interview the person next to you. Find out as many details as possible and then present this person to the class. Talk about what you did this summer. Other students ask follow up questions. In partners, brainstorm why it’s important to learn Spanish. Then have a discussion about this as a class. Students write interesting facts about themselves on a piece of red paper and crumple it up into a ball. Then have a Tomatina Festival (tomato throwing festival) in Spain. Students throw balled up paper at each other. After 1-2 minutes, say, “Stop”. Students each pick up one paper, read it aloud and the individual or the class tries to guess who wrote it. Have students do a structured “Todo sobre mí”, “Tout sur moi” presentation and writing assignment (lessons available in my Free Resource Library – sign up below). Whew! Guess I had a lot to say about the first week of Spanish class. Stay tuned to my blog this year because I’ll be posting more about how to teach your students all in the target language. Remember to sign up below for your free lessons. Happy Teaching! 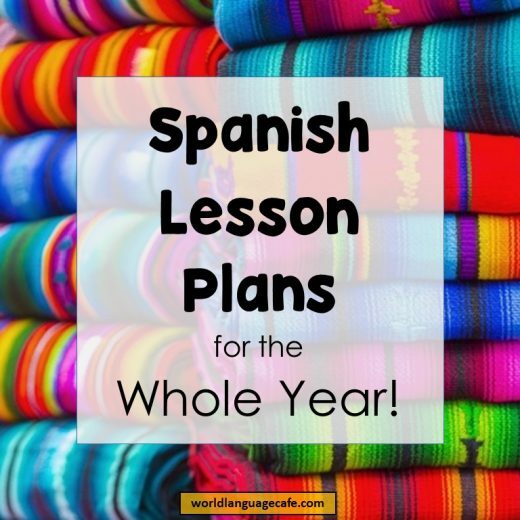 Spanish Lesson Plans for the Whole Year! 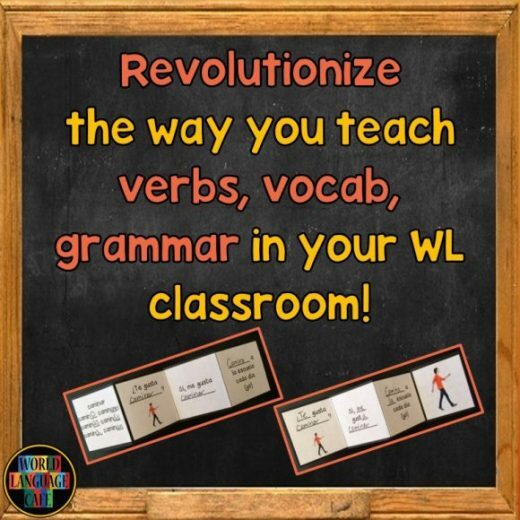 Revolutionize the Way You Teach Vocab, Verbs, and Grammar!